Last Saturday we thought we had reached a new milestone with Tanner. He was playful, eager to get outside, happily rolled in the grass for the first time in weeks, and was eating like a champion. All signs were pointing in the direction of being restored to better, if not full health. Then on Sunday we noticed that he was limping. He was really favoring his front right paw. 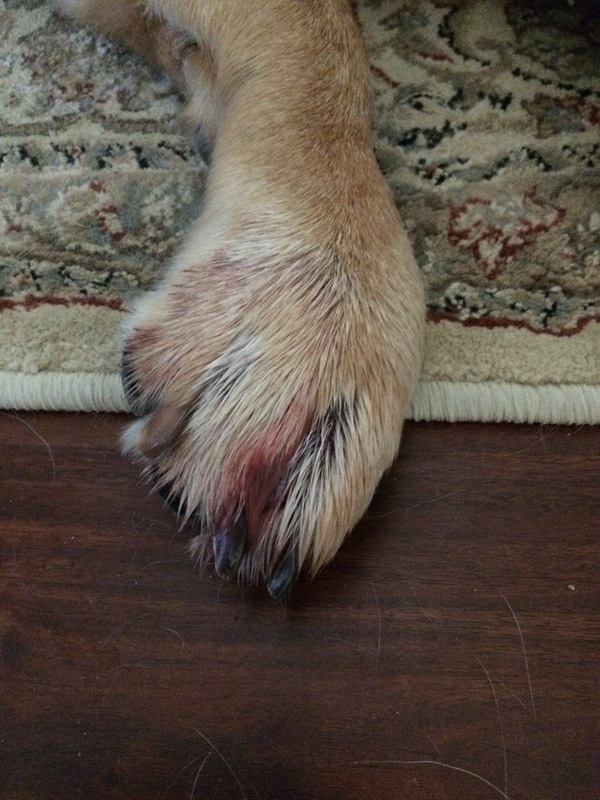 We couldn't figure out if the issue was with the leg or the paw, if it was an injury or just stiffness from inactivity. Monday things worsened and we noticed bleeding coming from the paw itself. Initially we thought he had lost a nail even though we couldn't figure out how he would've done that. He was in a lot of pain, having a lot of trouble walking, and bleeding. He was also very lethargic and less interested in eating. We were scheduled to see the vet Tuesday morning and were glad for that as we noticed there was also still bleeding on the right side of his mouth. Today we spent 3.5 hours at the vet. Poor Tanner. It seems that the issues with his immune system just seem to keep escalating. This time it appears as though a condition known as vasculitis has emerged. It's basically a swelling of the blood vessels caused by many different things. Our little guy's immune system is just under a lot of pressure and he's having a rough time holding off all of these secondary issues. The vet suspects that it is this issue that is keeping the mouth from healing in the way she would like it to as well. She said that the one side looks great, but the right side is still quite red and sore. Initially, after consulting with our regular vet by phone, they were both thinking we should see a special internist, in Orange County, which is about 2 hours from where we live. They were talking about doing a bone marrow aspiration and more extensive procedures and our heads were just spinning. We cannot put him through that. One weird thing that they were all seeing is a drop in white blood cells, which shouldn't be given that he has had so much infection in his body. 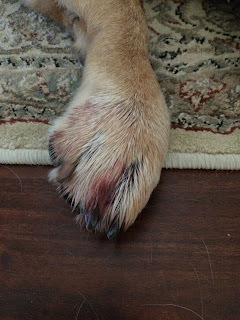 So the vet did say that doing a blood panel would at least tell them if that count was still low and if that were the case, then we'd be looking at a very serious situation. So after a lot of tears, we decided that blood work was the first line of defense. Fortunately, the blood work showed that the white blood cells were rallying so that was a big encouragement that his body is still fighting and that he is able to produce white cells. SO, we finally decided that big gun antibiotics along with pain management meds are what we will try for this week. They recommend leaving the foot open to the air and hoping that the wounds will close up again on their own. It's been a pretty rough day as you might imagine. The choices we are facing are not easy. Tanner is 11 and it just seems like his issues are escalating. There is definitely a root cause in his immune system that seems to go back to the eye issue that started in London, the skin issue, the mouth issue, the vascular issues, but, at this stage the procedures needed to get a clear diagnosis on the base causes are just far too invasive for our comfort level. And every dog owner has to ask, to what end? Tanner has given us more love, more unconditional joy, more laughter than we could ever have imagined. 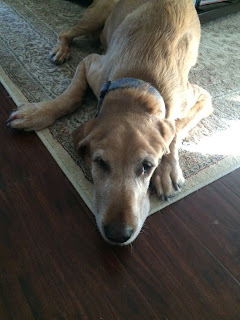 While neither of us can imagine our household without him, we do know that eventually he will head for doggy heaven. So right now, we are trying the new antibiotics, upping the ante on the pain meds, feeding him good food that he loves, and loving him as much as we possibly can, which isn't hard. We took him out on his daily cart ride tonight and he was so happy. It's a beautiful evening here in the desert. A bit cooler and just lovely. His foot does better on grass than the rock or sand so we'll try to get him to the grass as often as possible. He's very quiet now. Hoping the antibiotics will get to work immediately and that even by morning we'll see a happier dog. He still loves to be outside basking in the sunshine. Thankfully, his skin issue is almost gone, so he can be in the sun as much as he wants to be. Also, the eye looks fantastic so maybe he'll rally and heal from this too. But we certainly would like for everything to heal without another issue emerging as one gets under control. Thanks for all the love we receive from our canine-loving readership! All of you pet owners and dog lovers know the anguish of a failing pet. Thankful that we are at home in California with him. Praying he'll rally so we can enjoy more time outside with him when the oppressive summer heat abates. 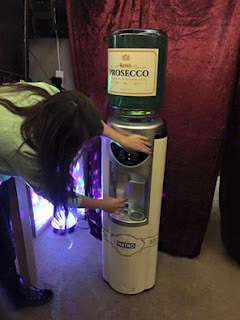 As for me, well, I'm ready to order one of these.